The government also awarded several companies, startups and individuals for their IT-related contribution towards the state. 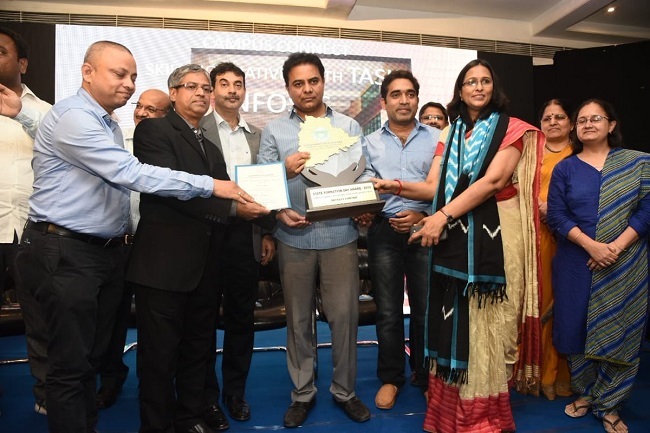 Marking the fourth year since the formation of the state of Telangana, K T Rama Rao, minister for IT, Industries, MA&UD and NRI Affairs released the annual report 2017-18 of the Information Technology, Electronics and Communications Department. As part of the event, the minister also launched several new initiatives aligned with the vision of Digital Telangana. KTR launched T-Web, TASK Mobile VAN T-SOC, T-SWAN, and TSTS ABAS. An MoU was also signed between the government of Telangana and Data Security Council of India to set up a Centre of Excellence on Cybersecurity in Hyderabad. This CoE, the first of its kind in India, will focus on creating an ecosystem for cybersecurity R&D, product development, capacity building, and innovation. T-Web aims to make Telangana’s government websites usable, uniform, user-friendly and universally accessible. The components of the project include T-Web Search, a One Stop Shop (OSS) for Telangana government Information and Services. As part of T-Web, Guidelines for Telangana Government Websites (GTGW) were prepared based on Guidelines prepared by GoI but goes beyond to include Compliance to Govt. Acts, SEO and Mobile-friendliness, Social Media Integration and Localisation. Finally, T-Web also includes a standardised website framework that serves as a guiding document for building Telangana Govt. Websites quickly, easily and economically. Telangana Security Operations Centre (T-SOC) aims to secure the government data and critical infrastructure using state-of-art threat detection and response capabilities by setting up a Security Information and Event Management (SIEM) solution. In phase-1 of T-SOC, entire infrastructure of State Data Centre (SDC) and Secretariat Area Network (SCAN) has been integrated with T-SOC. Telangana State Wide Network (T-SWAN), marks major upgradation in the erstwhile SWAN infrastructure of Telangana. Under T-SWAN, the broadband connectivity at District HQs, and Mandal HQs has been enhanced significantly in a short span of 6 months from October 2017. The HQs of all 31 districts (earlier, 10) have been provided with 34 Mbps internet connection along with a 20 Mbps (earlier 12 Mbps) dedicated intranet connection. More importantly, the connectivity to old and new Mandal HQs has been improved from 4 Mbps to 12 Mbps bandwidth. The beneficiaries of a 200% increase in bandwidth include more than 46 government departments and 101 sub departments, MeeSeva Centres and other online services. Electronic Service Delivery is continuously looking for avenues to improve the incomes of the Mee Seva Franchsiees. As part of this ESD signed an MoU with IFFCO BAZAR, a leading e-commerce portal for agricultural inputs. Under this MoU, the farmers will be able to access IFFCO Bazar, through MeeSeva Centres, to purchase and get home delivery of agricultural inputs at no additional cost. Mee Seva Franchisees will get additional income paid by IFFCO. This is a first of its kind initiative in the country wherein the farmers can use assisted online service of Mee Seva to buy agricultural inputs through on line. 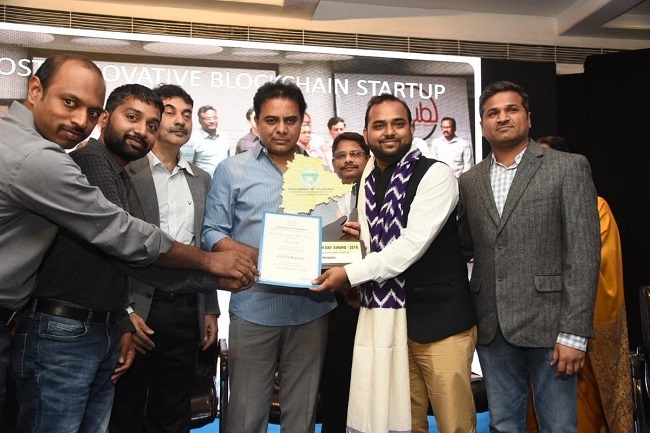 As part of the event, the government also awarded several companies, startups and individuals for their achievements and contribution towards the IT industry in the state. Infosys was awarded for the highest software exports, and employee generation, while Tech Mahindra was awarded for outstanding CSR and also for promotion of a tier-2 city (Warangal). 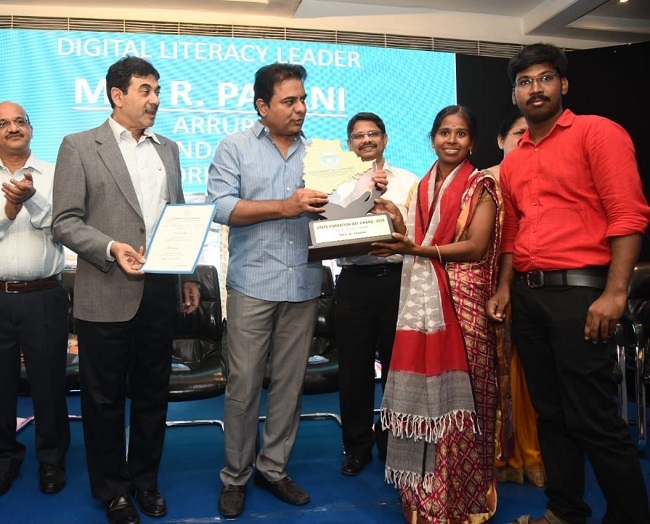 R Pavani, who set up Digital Seva Kendram in Arrur village, Valigonda Mandal, Yadadri district and providing various services like G2C services, Passport, PAN card, Insurance, Education and Digital Literacy training was awarded the Digital Literacy Leader awards. She is providing Digital Literacy training to their villagers especially to SHG Women in the village. The job aspirants in the village are preparing for exams online with the help of Digital Literacy. V. Nagarani, Pulyala Rajani, P Koteshwar Rao and Guguloth Rajesh were also awarded the Digital Literacy leader award. Some startups were also awarded. ChitMonks was awarded the most innovative Blockchain startup. Two year old ChitMonks, based out of T-Hub uses a state of the art Blockchain technology to bring the various registered Chit fund companies in the state along with the registrars onto an immutable, smart contract enabled, highly secure platform. Adonmo won the most promising AdTech startup. Also based out of T-Hub, Adonmo is building a first-of-its-kind digital outdoor advertising network capable of contextually targeting ads using cutting edge IOT, AI and Computer Vision technologies. The most innovative smart cities startup award was given to Ayasta, which is an enterprise focused IoT startup working on Digitising Electrical. It has built a proprietary platform called CEGMA, which is a culmination of sensors, Machine Learning and Computer VIsion to monitor, analyse and detect anomalies in the electrical systems both inside a given facility and outside in the electrical grid. Aadhaar-based startup Syntizen won the most innovative Aadhar-based solutions startup. Syntizen Technologies is an Identity Solutions based startup powering organisations with the Aadhaar eco system in India. The startup also manages the complete Aadhaar eco-system for the state of Telangana and Uttar Pradesh along with their private clients.